加茂ってどんなところ？　What is Kamo, Tsuruoka City like? Kamo, Tsuruoka City was widely known as a natural good harbor through the ages. For Edo period, the Port of Kamo has developed as a transit port of merchant ships and prospered as a strategic point of sea traffic next to Sakata. After the opening of JR Uetsu Line, the Port of Kamo finished a role as a commercial port through the development of rail transport, it now leads to as a fishing port mainly. There are many temples and shrines in mountains skirt the port and there are still many storehouses, residences, private houses and small alleys, we can find the trace of the days of prospered as a port town on these. Kamo district has Prefetural Fisheries Exp.Stn. and Kamo Fisheries High School apart from Kamo Rainbow Beach(beach park) and Kamo Aquarium. And the district has become a center for marin research and marine education at present. Old cityscape and beautiful scenery are left in Kamo district. The district has been designated as landscape conservation by Yamagata prefecture along with Oyama district and Haguro district. Get off at Tsuruoka Station of JR Uetsu Main Line. From the station, about 20 minutes by taxi or transfer to a bus bound for Kamo. The closest station to Kamo is Uzen Oyama Station, from the station about 10 minutes by Taxi. From Shonai Airport about 20 minutes by Taxi. 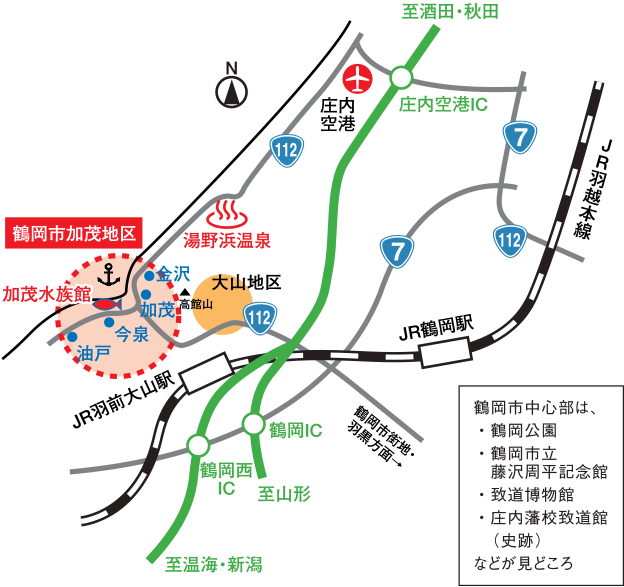 Or take a bus for Tsuruoka Station and transfer to a bus for Kamo at the Tsuruoka station.